Today was the big Easter egg hunt at church and I thought I would recap it for everyone since nobody got to come down/up/over for it. The committee that Anita chairs coordinated the whole thing and it was a huge success. I think they "hid" (read: threw out in the yard) close to 1600 eggs or something like that. Maybe it was 1200, but either way... a TON of candle-filled little plastic eggs. 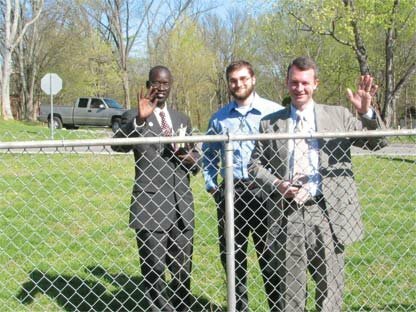 The little kids (toddlers through Kindergarten) picked up eggs inside the fenced in playground, and the older kids picked them up in the rest of the yard. The men stood along the road outside to make sure none of the "big" (1st grade and up) kids went out in the street. 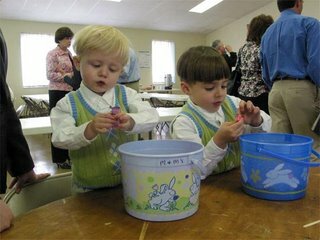 They were all excited beforehand and many of them were caught peeking out the windows in the fellowship hall to try and find the best spots to go get eggs - Conner included. I think Conner probably needed a bigger bucket - like 5 gallon. He was one of the big kids in the small area and he didn't have any problems filling his bucket up really fast. Zach on the other hand, was a little slower, but he managed to have fun and pick up enough eggs to nearly fill his bucket. 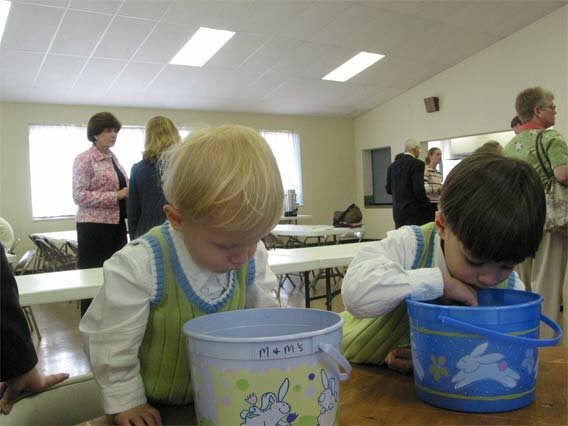 After it was all said and done, the kids had to all come inside and we had to empty the plastic eggs out because the church recycles them and saves them for next year's egg hunt. When it was all over, the buckets didn't look as full, but they were still a nice pile of sweet candy goodness. Both boys surveyed their loot pretty intently looking for that perfect first piece of candy. Another neat thing that happened Sunday was we had a guest speaker at our Methodist Men's breakfast. A young (using that loosely here) man of about 24 or so named Paul. He is one of the Sudan Lost Boys. He is going to school at David Lipscomb universvity here in TN and is working on going into ministry and missionary work. He, along with some other 30-35,000 boys marched 1,000 miles from Sudan to Ethiopia in the late 80s (around 87 or so) to escape the religious war raging in their homeland (Muslim north against the Christian south). They all traveled without parents - either having left them behind to continue in the fighting or having already lost them to the war. Paul said many children died during the exhaustive march. Many were eaten by wild animals. Others died of starvation, disease, or dehydration. Remember, this man was about 7 or 8 years old when he went through this. He said nearly 10,000 died by the time they reached Ethiopia. After they spent a few years in Ethiopia, they ended up having to leave once again due to civil war that was breaking out there and threatening their safety. They took foot once again and marched nearly 1,000 miles once again to Kenya where they ended up staying in refugee camps that at least provided them safety. These boys traveled with little to nothing. Many of them carrying with them nothing but a bible as their sole posession, and using their faith as a foundation for strength to get through the ordeal set before them. Paul said he was in Kenya around 10 years when he got the opportunity to come to the US through a relief program. He came here in 2001 I believe if I remember correctly and he has been in the Nashville area since 2002. He's now a second year undergraduate student with goals, unbelievable faith, a message of hope for others, and a passion to help and minister to others. He was a pretty remarkable, kind and very interesting guy. He was fun to talk to and I really enjoyed getting to spend a little while just chatting with him during the Easter egg hunt.